Aki's project has brought some fun elements to the lab that I have not been directly involved in before. He is sequencing RNA from across the genome from various male and female urchin tissues and needed some larvae to get RNA early in development before the urchins have settled out to the sea floor and are dispersed in the plankton. 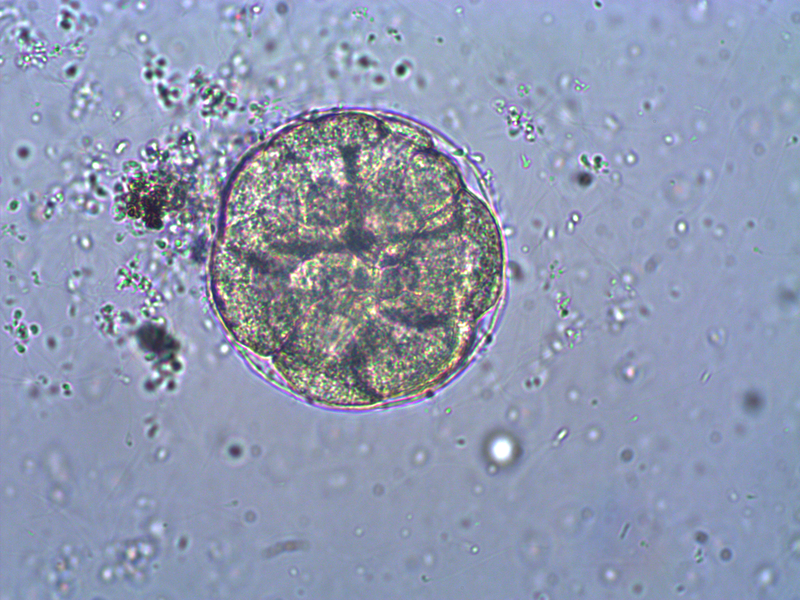 So, how do you find microscopic sea urchins larvae in the ocean, much less, how do you know if they are the right species? It is practically impossible, instead it is simple to make your own---sea urchins are a classic model organism to study early animal development in the lab. We went out on two different weekends to collect adult urchins and bring them back to the lab. It tuns out that if you inject them with potassium chloride, or even easier, give them a good shake so they think they are being eaten, they panic and release their gametes. You can collect them and mix them together. We also added some heat killed sea water (brought to boiling them back down to room temperature) and took a look at the eggs a day later under a compound microscope. 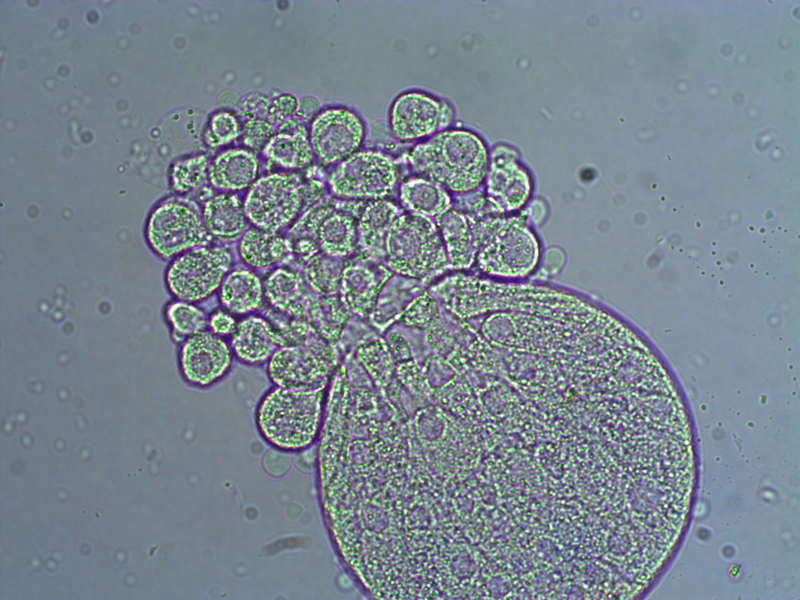 In the image above are several fertilized eggs at the initial stages of division. 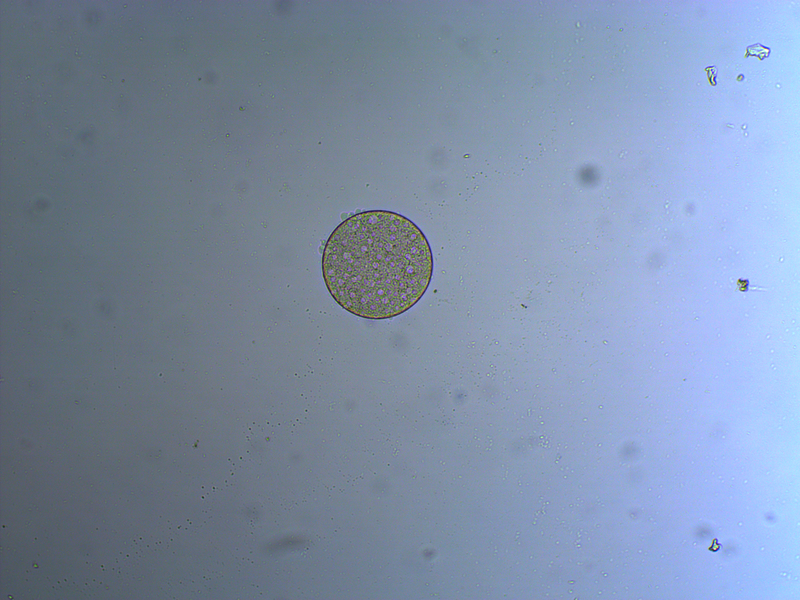 Slightly up and right from the center (about 1 o'clock) is a single undivided cell. Just down from that near the center is a cell that has divided into two. In the upper left is an zygote that has divided again into four cells (one is on top of the others, stacked like a tetrahedron). Moving down from there to the lower left of the image, is a zygote that has divided again into 8 cells. The initial cell divisions follow a power of two, (where is the cell number and is the number of divisions), before the cells become specialized and divisions proceed at different rates. Below is a closer view of an embryo that has divided into at least 8 cells. If you look closely you can make out the cell nuclei. 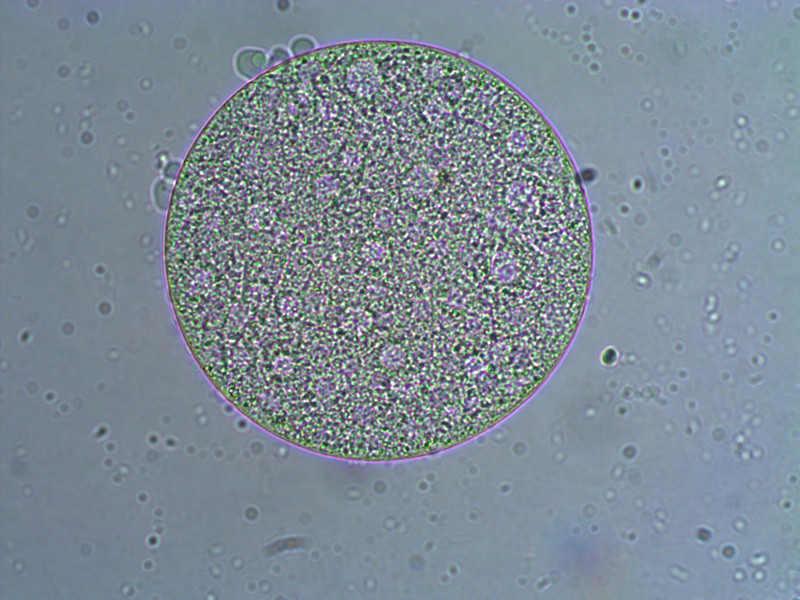 The upper left one is the best defined in the image; it is a smaller circle within the cell. And there are also hints of sperm flagella in the sea water around the cell (they look like faint lines like individual fibers that are out of focus in various directions). 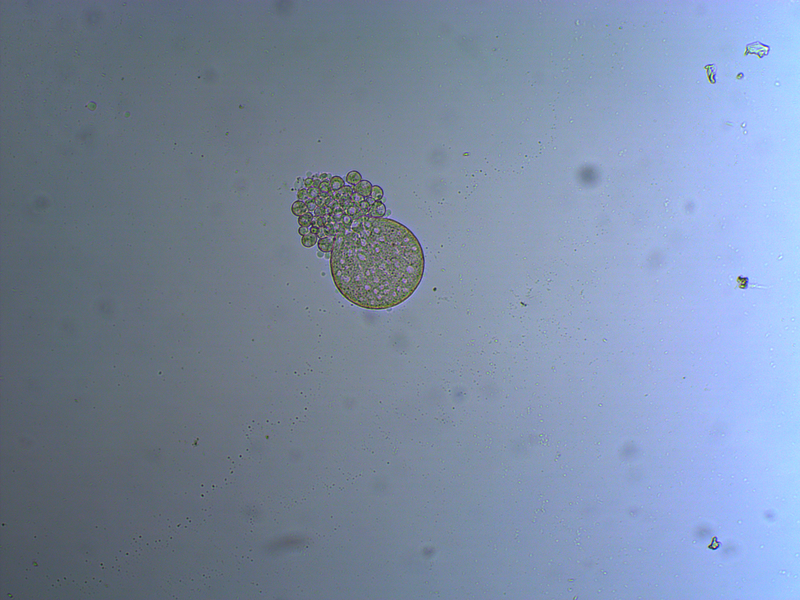 And below is an embryo that is entering the blastula stage. 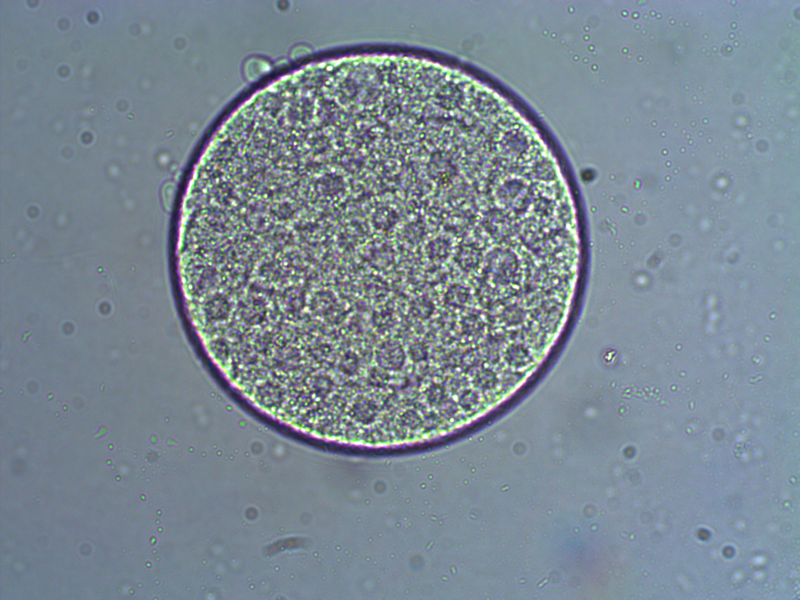 The cell nuclei appear slightly more purple in the image. And a close up at two different focal planes. In the next images the cover slip pressed down too hard and the egg coat (egg shell?) has ruptured and spilled out some of the individual cells. 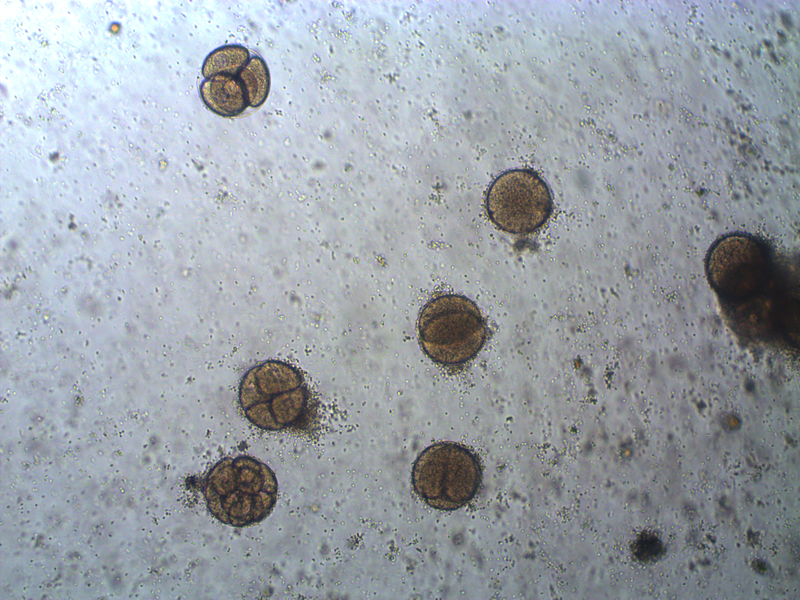 Interestingly, urchins zygotes can loose up to 3/4 of their starting cells and still develop into normal adults. This entry was posted in Uncategorized on December 27, 2014 by Floyd A. Reed.